On the third Saturday of each month, scientists from Scripps Institution of Oceanography or elsewhere in the community join our special SEA Days program to share their exciting research with aquarium visitors. To celebrate Birds of the Sea this month, we’ll be welcoming two Scripps researchers: Cotton Rockwood, a doctoral student in marine biodiversity, and. Trevor Joyce, a doctoral student in biological oceanography. Join them for SEA Days this Saturday, March 17, from 11 a.m.-3 p.m.
Cotton: I study the conservation of seabirds in a very general way. Seabirds are a really important part of the marine ecosystem. As one of the top predators, they impact how animals interact with each other and how energy moves through the system. Humans are causing major impacts to seabirds – from fisheries to pollutants to land-based impacts on their colonies. More than 30 percent of seabirds are threatened under the IUCN listing, and there is potential for a lot of these amazing animals to go extinct or ecologically extinct. The main way scientists have approached seabird conservation is to look at a particular species in trouble, then identify and address the problems they face. I am trying to bring a more holistic approach to my seabird research and conservation. For example, what changes can be made in North Atlantic fishing practices that woud impact a number of seabird species, instead of just one? My goal is to create a large-scale analysis that allows us to address these threats in a more effective way. 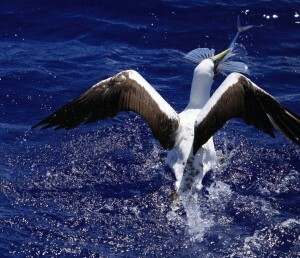 Masked Booby catching a flying fish. 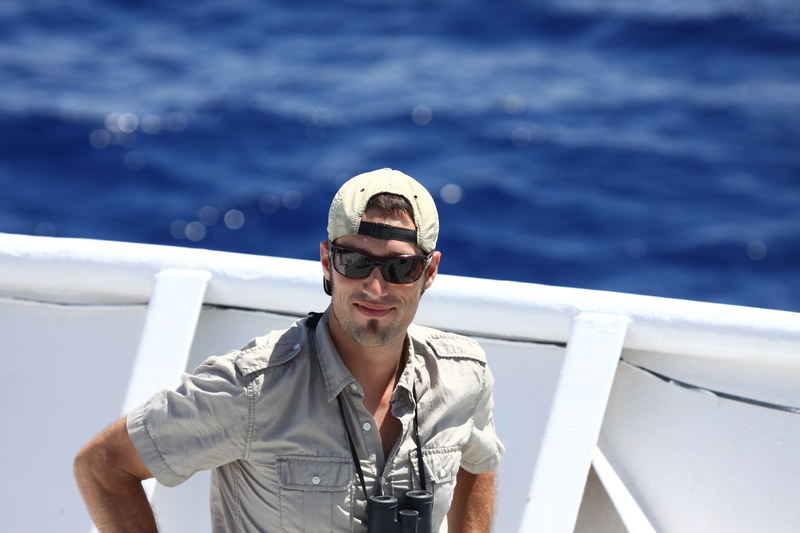 Trevor: I study how seabirds and large predators like tuna, yellowtail, and dolphins interact with each other. These predators are really important for creating habitats for seabirds. You can see this right offshore in San Diego when a group of predators stir up smaller fish into what is called a “bait ball.” These bait balls are great feeding opportunities for seabirds. I am particularly interested in how seabird foraging is affected by the impact of fisheries and climate change upon ocean predators. For example, I study obligate foragers in Hawaii, birds that depend upon tuna to stir fish into bait balls. Both tuna and seabirds are vital to the dynamic of this ecosystem. 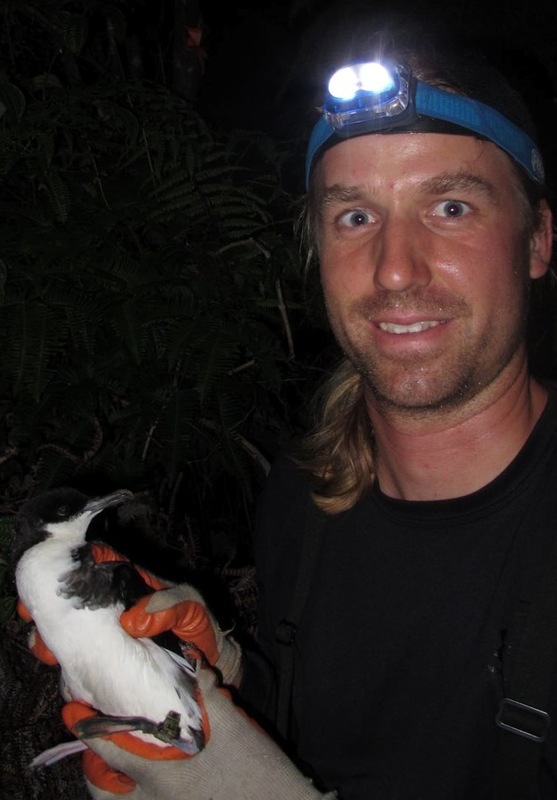 Trevor Joyce with a Newell’s shearwaters (Puffinus newelli). Cotton: Getting outside, living in the natural world, and being awed and astounded by the natural world. I was lucky because I grew up in the country. I think it’s so unfortunate that kids don’t get exposed to nature in the same way. When I was younger, my playtime was going outside and playing in the woods. When I was growing up, my mom went back to school to get her degree in botany. We would go on hikes through the forest and she would spout all the Latin names for the plants we saw. My mom also loved pointing out interesting plants as we drove in the car. We called it 60mph Botany. Q. What do you like best about being a student at Scripps Institution of Oceanography? Trevor: The best part is the opportunity to work with my advisor, Lisa Ballance at NOAA and SIO, and to get out on the ocean to conduct fieldwork. 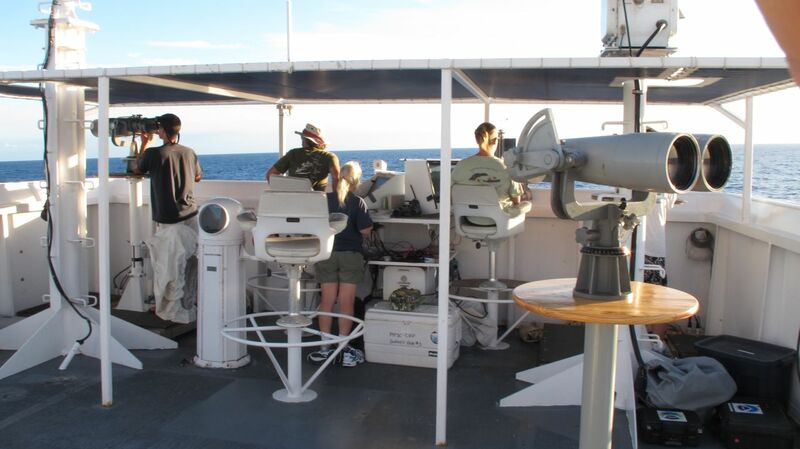 NOAA funds cruises that go out to sea to study seabirds, fish, and marine mammals in their natural habitats, far from land in the California Current and Tropical Pacific. Being able to go into the field is great, and having the opportunity to learn from some wonderful professors at SIO is truly amazing. I most enjoy fieldwork, both ship-based and at the nesting sites. I have a tagging project underway at the nesting grounds of Hawaiian birds such as the Hawaiian Petrel and the Newell’s Shearwater. We attach very small and lightweight tag to bands on the seabird’s legs. The tags have a sensor that can read light levels, which allows us to record location data. A pressure sensor records diving depths, and a wet/dry sensor tell us when the bird is submerged. We attach the tags and recover them at the nesting site after a full year. There are currently forty Endangered Hawaiian seabirds out there with these tags, giving us a better understanding of their lives away from the nesting site. Lots of looking: seabird research at sea. Q. What is your favorite bird? Cotton: I really enjoy the Booby bird. They are incredibly goofy birds, and by doing research out at sea, you often get to know individual Boobies that follow the boat. Sooty Shearwaters are also another favorite. They are amazingly graceful and there is something about the way they arc across the water. Trevor: I like working with the Newell’s Shearwaters, which breed in the high elevation in the Hawaiian Islands. It has a really raucous, perhaps somewhat grating call but it’s a beautiful and endearing bird. It is known in Hawaiian as the ‘a’o, an onomatopoetic for the sound it makes. Click here to listen to a Newell’s Shearwaters. I regularly walk along the La Jolla shores. This past week, I have noticed what appear to me to be juvenile Mola Mola washed up onshore. I have seen up to a dozen of them. They are all around 1-2 feet in length/width. I have pictures but they aren’t great as I took them at night. Do you know what is causing their demise? Would it be this storm we got this week end that washed them ashore beforehand? Hi Nancy, It’s very difficult to determine the cause of an animal’s death without a necropsy, and by the time an animal washes up on shore, it’s usually too decomposed. It’s possible the storm played a part, although we did see a report of a mola that was spotted on the beach before the weather turned bad.